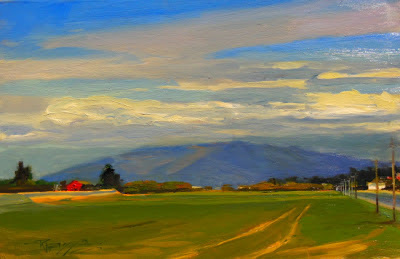 As I have said before, I love the Skagit valley! There are paintings in every direction! 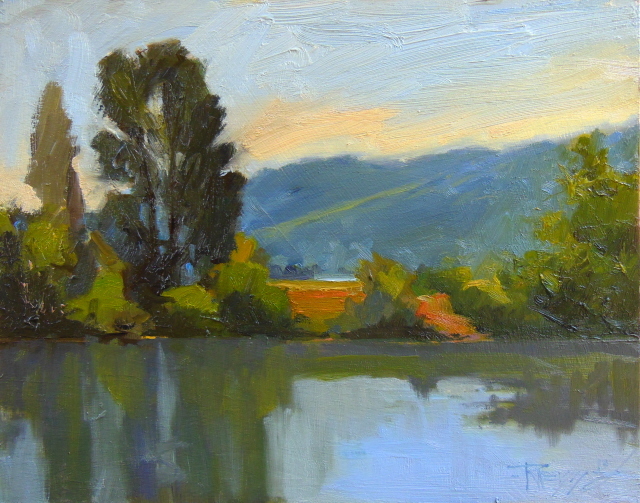 After I finished the painting of the Conway Church, all I did was turn 180 degrees and start this piece of the Skagit river right behind me. I was drawn to the atmospheric distance of the far hills, the reflection in the water and the vertical element of the cottonwood trees in the middle ground. 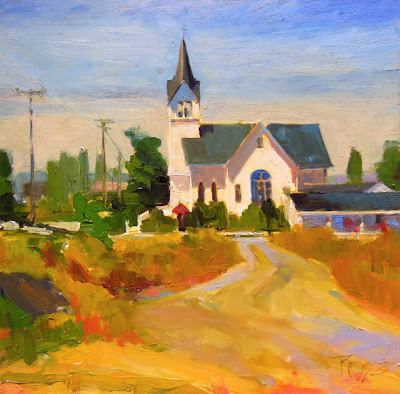 I'm starting to get a little routine going after these painting trips, one of which is to set the paintings up when I get home and study where I can improve each piece ..or not...In the case of the Conway Church, I did very little. In the Skagit River painting, I worked it over adjusting value and hue problems pretty extensively with the photos I took on location. Suns out! I better get painting! I headed back up to LaConner after the group show to connect with Mark Bistranin and to do some painting on my own. This church in Conway was my first stop. 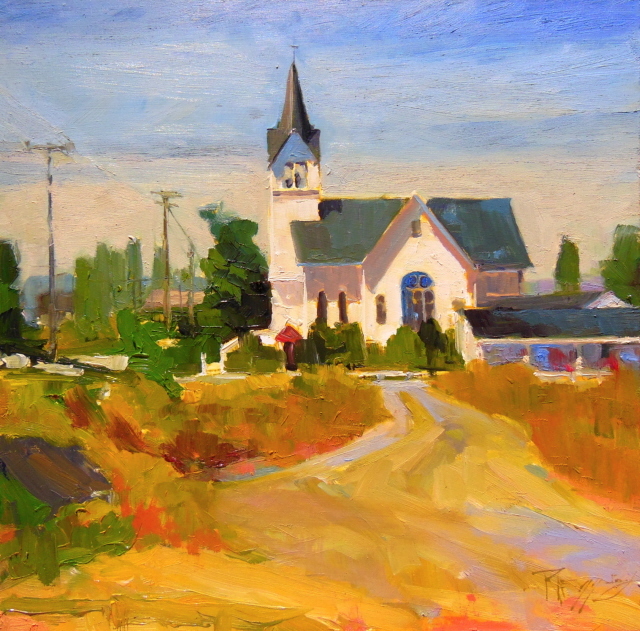 I had been passing it frequently and knew it would make a great painting in the morning light. 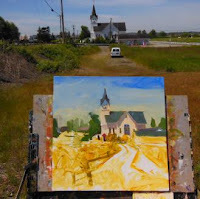 There was a perfect spot for me to pull off the road and set up on the dike for a good view of the church. 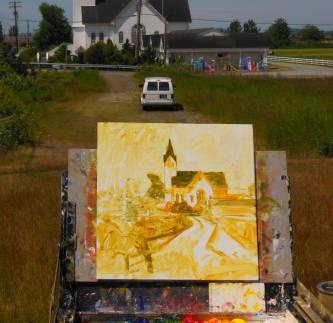 In this picture you see my underpainting to sketch in the composition and set value transitions. In this pic I am filling in the color. 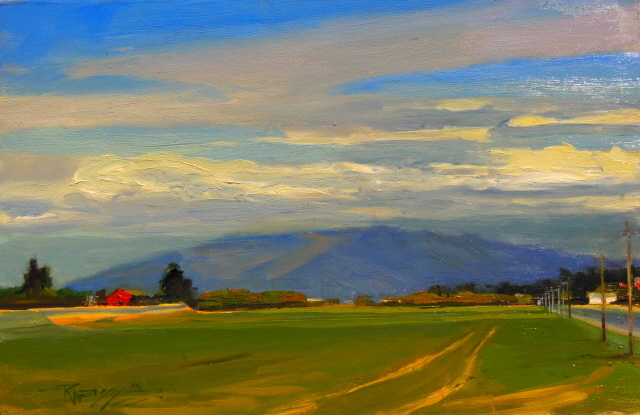 Starting with the darkest values of the roof and shadow areas and along the entire horizon line. Then I come in with the lightest sky values and paint around the darks paying close attention to my edges and keeping the color clean. 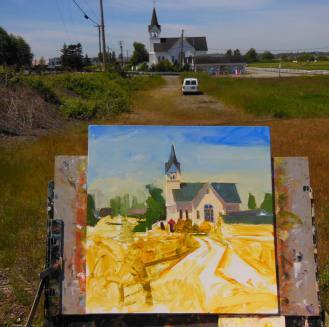 After that I will move down the painting , modeling the grasses and using the drive into the parking lot as a lead into the painting. One of the state parks we went to was Deception Pass, which has several areas that you can enjoy. 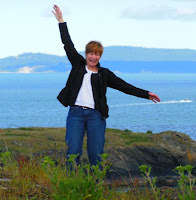 We ended up at Rosario Beach. 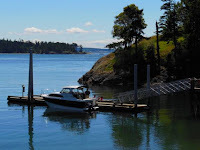 I have never been to this area before and was taken by the beautiful views of the strait. 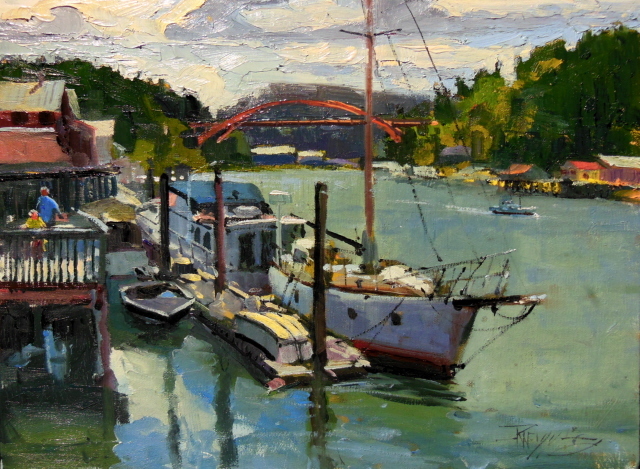 I attempted two other paintings at the park this day and ended up scraping them both!..One was this boat setting at a little dock which I thought was a good idea at the time..Oh well . Not every painting is a masterpiece.. I tried one more at the end of the day and just didn't have the gas to get er done.... Too much hiking and eating and having fun talking to everyone . Sometimes , when paintings are not working for you it's best to stop and redirect. Just enjoy the awesome beauty of Gods creation. Take a few deep breaths , give yourself some space and trust that the inspiration will come back to you the next day. The LaConner area is a plein air painters paradise! Not only are there paintable views in every direction , there are also lots of places to pull off the road and set up. I found this spot just past the round-about at the end of Morris Street. 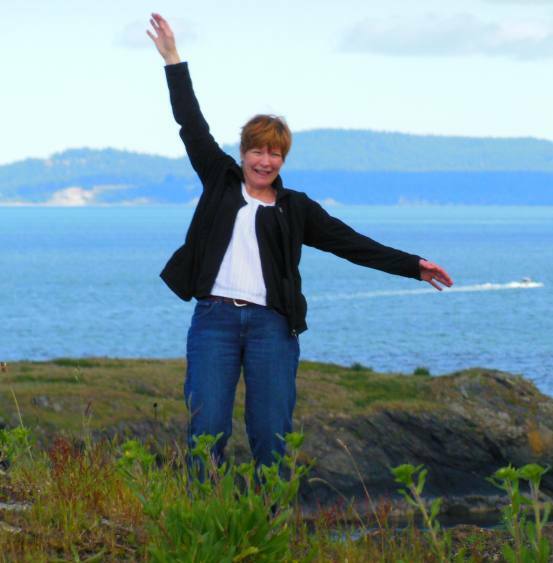 When we first arrived in LaConner, Ann, Paula Ensign and I did a quick scout of the town. I decided on this spot. A great view of the boats and the orange bridge from the deck of a building that is not in use. 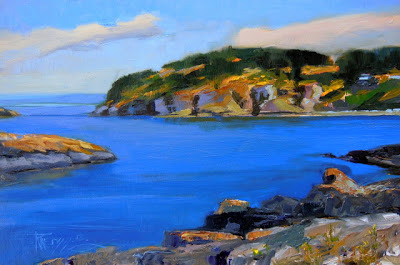 I used a canvas that was re-purposed from a former failed attempt at plein air painting.....Feel like I redeemed myself a bit with this painting! 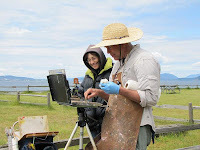 Since my last post a lot of plein air painting has been happening!! 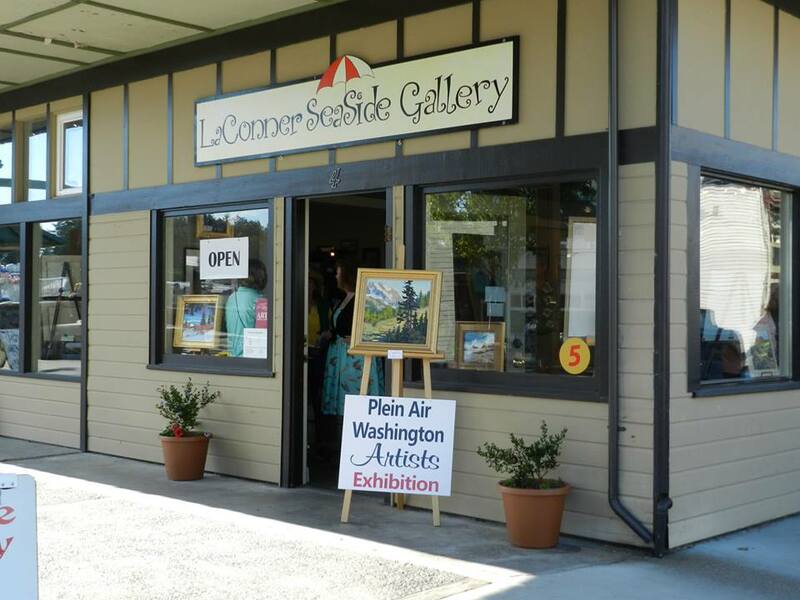 First of all the Plein Air Washington Painters had a group show at the Seaside Gallery in LaConner Washington. 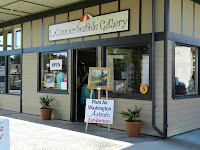 The show was hosted by the good folks at the Seaside Gallery. Mark Bistranin, Mark Conley and Dave Nichols. Each fine artists and great guys! 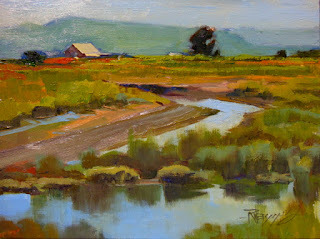 We all brought a few studio paintings and some plein air work for the show on Saturday night. 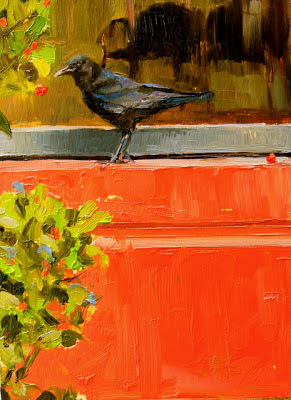 My painting "Tulip Time" sold among others that night! The plan for this PAWA event was to have the group show on Saturday, then paint all the next week and have a wet painting show the following Saturday. We visited two state parks as a group and then I did some more painting in and around Laconner on my own... 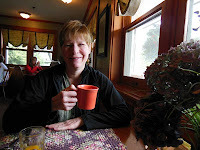 I have a lot of paintings and photos to post from this trip so stay tuned!...All in all it was a great week. But the term “murder of crows” mostly reflects a time when groupings of many animals had colorful and poetic names. Other fun examples of “group” names include: an ostentation of peacocks, a parliament of owls, a knot of frogs, and a skulk of foxes. 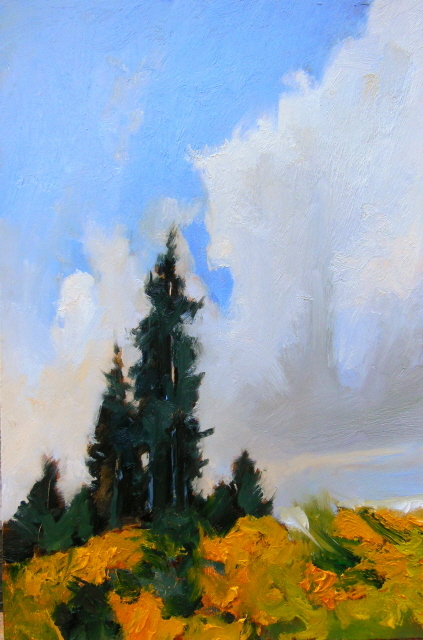 Heading to the freeway entrance one day last week my attention was arrested (as often happens) by this view of the tall fir trees on the hill surrounded by the scotch broom in full bloom. Some folks don't like the scotch broom....I'm not sure what to think about it except that I almost always use it in compositions for color notes and contrast when it is out in the early summer....I have heard that Washington State has given up trying to eliminate it. Apparently it was introduced from Europe in the 1850's for erosion mitigation and quickly dispersed around the country.